Growing: Â Easy Jack O Nesia is an easy to grow plant from the breeder Karma Genetics Seeds. It was developed when Karma Genetics Seeds decided to cross the genes of Amnesia (D-cut) and Jack Herrer #22 to create an amazing seed possessing each of the parentâ€™s characteristics. Jack O Nesia has won last 2009 at the ICMag 420 cup. This predominantly sativa strain has been incredible since its ancestors were also incredible. 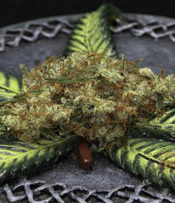 Its ancestors include Super Silver Haze, Skunk #1, Northern Lights #5, Shiva Skunk, and Haze. These strains are the proof that Jack O Nesia is a barely credible cannabis strain. Jack O Nesia is such a pleasure to watch while maturing especially when it starts to flower after 74 days. It will have a medium height and yield perfect for indoors. Weed smokers will definitely fall in love immediately with this strainâ€™s candy like bubblegum to spicy haze taste and aroma. Jack O Nesia has never been a disappointment ever since I planted and use it. I was very happy this strain was introduced to me.